Bass fishing is good. Old road beds, such as the one at McGee Access are great locations to fish with Carolina rigged worms in any color. Cranking main lake and river points with a deep diving crank baits is still productive for early morning fishermen. Check out the mouth of Whitewater Creek and fish deep for those bass that have gone to the bottom for the summer. Spend a little time looking at the points and underwater islands with the Lowrance Structure Scan and Down Scan technology to find baitfish in these area before fishing. This will help narrow down where the fish are. Up in New River, go past the bridge and use a dark jig and a Hales Craw worm craw worms on the heavy bank cover can get a strike. Stay close to the river current on points. Buzz baits can be good all day in the pockets right off the river. Go past the 219 bridge and hit every pocket no matter how small. Cast right on the edges of the pockets points and work the bait to 13 feet. Ask for a free sonar set up sheet by sending me an email to ken@southernfishing.com. Please tell me what model machine you have. We recommend Overboard Designs for 2956 Waterworks Road Buford Georgia 30518 Phone 678.714.7122. We recommend Transducer Shield and Savers. Protect your investment. We have the LOWRANCE Gen 3 Touch and the game changing technology in the NEW 3D Lowrance Technology on our boat. Bring any HDS machine only to Lake Lanier and learn it ALL in one day. Call Ken for details. See our Southern Fishing Schools page for the latest screen shots of the LOWRANCE 3D technology. See bass over a ladder in 10 feet of water 168 feet from my boat. www.lowrance.com. 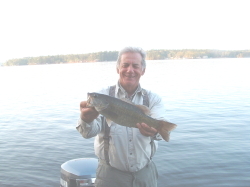 We have these books for sale BASS FISHING ON WEST POINT LAKE BASS FISHING LAKE RUSSELL BASS FISHING WEST POINT LAKE and BASS FISHING LAKE HARTWELL. These books have lots of bass fishing and covers every week of the year. Each book $39.00. If you would like a sample of any book send us an e mail to ken@southernfishing.com. Stop by www.gon.com on the forum page for current events. Copyright 2013 Southern Fishing Schools Inc. calls us to set up a school Maps and Depth Finders or SONAR and Rods Reels and Lures for Bass. 770 889 2654. This entry was posted in Fishing Reports on November 4, 2017 by ronniegarrison.